Take the stress out of meal planning with these gluten-free and vegan holiday recipes perfect for Thanksgiving and Christmas! Planning for holiday meals can feel overwhelming. And it can be especially difficult if you’re new to a plant-based diet. I’ve put together a menu of my favorite vegan holiday recipes that your guests are sure to enjoy. And you won’t have to spend days in the kitchen getting ready for Thanksgiving or Christmas. In addition, many of these dishes can be made ahead of time. Try these Vegan Holiday Recipes and enjoy entertaining! When it comes to appetizers, I like to keep things simple with raw vegetables served with nut cheeses and dips. You can either make your own, buy them, or ask your guests to bring them. Or if you do want a hot appetizer, Soyrizo Stuffed Mushrooms are ready in no time. Then I can focus on making the rest of the vegan holiday recipes. For recipes you can make a day or two in advance, I like to start with the cranberry sauce. And my favorite is actually a raw relish, so no cooking is required. You only need four ingredients and a food processor to make Fresh Cranberry Apple Relish, and it’s refined sugar-free! Next I make Wild Rice Salad with Apple and Pomegranate. You can either make the wild rice in advance or the entire salad the day before your dinner. And I love cooking the wild rice in my Instant Pot electric pressure cooker since it’s fast and hands-free! And you can even make Easy Vegan Mushroom Gravy in advance! Add a little water if it seems to thick when you’re reheating it. I also bake some yams in advance so I can make Mashed Sweet Potatoes with Coconut Milk in no time at all. Next I may chop some vegetables in advance. Otherwise, the rest of the cooking I leave until the day of the event. These Vegan Holiday Recipes take very little time to make. For the main course I like to make individual Lentil Meatloaf Muffins. These are always a hit and taste great as leftovers, if there are any! And Mac and Cheese with Garlic Spinach is always a crowd favorite. You may not think of mac and cheese as a traditional holiday dish, but trust me, everyone will eat it up. 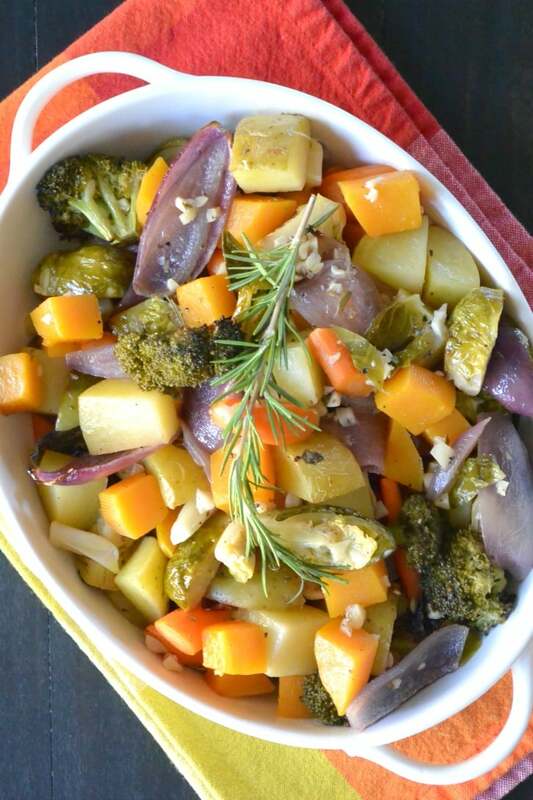 In addition, White Wine Roasted Vegetables go with everything and are beautiful on a holiday table. You can use any of your favorite seasonal vegetables. And of course we can’t forget everyone’s favorite, mashed potatoes! Make them in the Instant Pot, and they’ll turn out perfectly and stay warm all throughout dinner. If I want to add a few more dishes to my menu, I choose salads that can be prepped ahead of time. Some of my favorites are Mexican Christmas Eve Salad, Pomegranate and Apple Kale Salad, and Kale Quinoa Salad. I find my guests tend to offer to bring dessert. Or I suggest it if they ask. However if I do choose to provide dessert, I either purchase some or make Pumpkin Cheesecake with Pecan Crunch Topping. I hope you enjoy these Vegan Holiday Recipes! Please let me know in the comments what you plan to serve your friends and family. Thanks Mari! Hopefully there’s someone everyone will love. These all look so amazing but I really need to try Mac and Cheese with Garlic Spinach!! Thanks Jenna! That’s a good one! Love it!!! What an awesome roundup of holiday recipes! I’ll have to go through these for my own holiday party! Thanks Anjali! Hopefully they will take some of the stress out of your holiday planning! Such a yummy collection of recipes! The biggest problem is deciding which one to start with! This is a great collection of recipes! It’s so easy to go veg during the holidays, especially when you have posts like this one to help out- thanks for sharing! This is such an amazing roundup, thank you for putting it together Amy!